Murs lending me a hand to create some buzz about my Google project. This will definitely help me reach out to the masses. 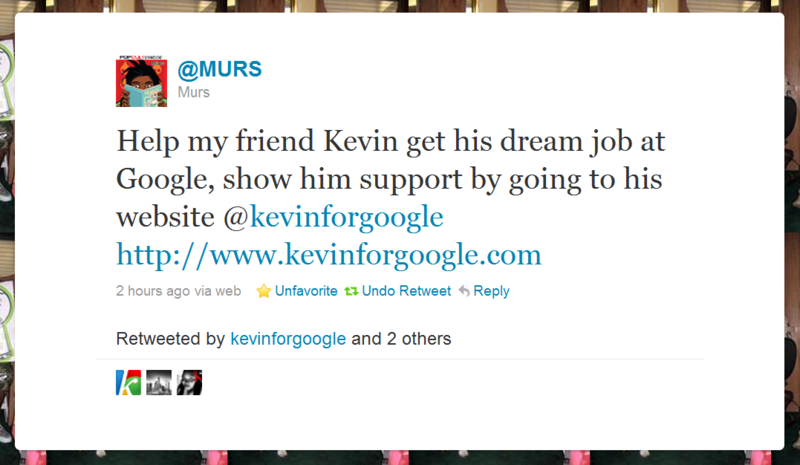 Thanks Murs. Check out his twitter, he will be doing huge things this coming year. This entry was posted in Freelance and tagged 9th wonder, freelance, kevin for google, kevin kwok, kevinforgoogle, murs, murs 3:16, murs new website, mursworld, nancy chui, rapper murs, twitter, wb records, website. Bookmark the permalink.